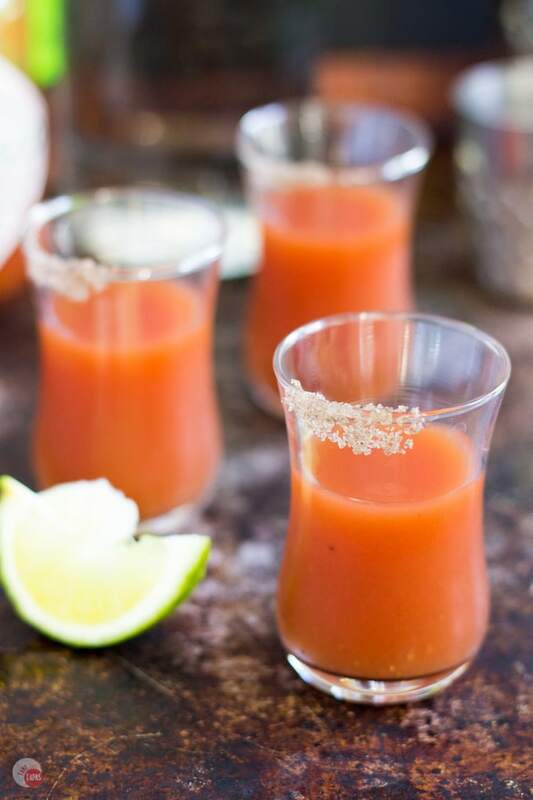 Bloody Mary Shots with Applewood Smoked Salt Rim! 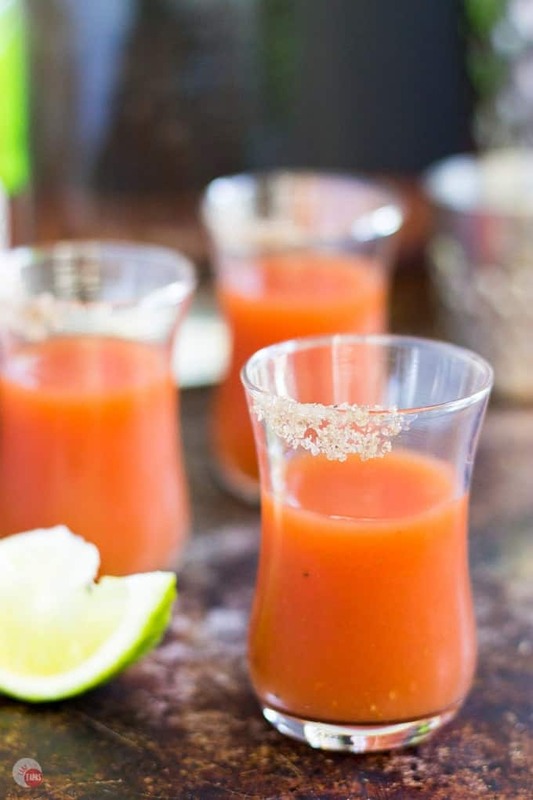 Home » Bloody Mary Shots with Applewood Smoked Salt! 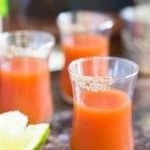 Bloody Mary shots are a great way to enjoy your favorite Brunch cocktail but in a smaller version! Rimmed with Applewood smoked salt that adds a great layer of flavor to the shot! Thank you, Uncommon Goods for sharing with me a beautiful bamboo cabinet filled with artisanal salt shots! I’m in love already and they are perfect for my Bloody Mary Shots! Bloody Marys are my most favorite breakfast/brunch cocktail. Mimosas are a close second but because of the bubbles, I am sticking with Bloody Marys. I also love tomatoes, so that tips the scales right there. I mean, who can turn down a savory cocktail? The best one I have ever had the pleasure of drinking was in a restaurant in Savannah, Georgia. Even though it is a burger joint, they are great with cocktails. Why am I so hooked on Bloody Marys? Their legendary Bloody Mary starts with a house-made mix and is loaded with garlic and pepper. Then they use a hot pepper vodka and extra hot sauce. To top it all off, they add an enormous salad arrangement on the top. The salad is anchored with a celery stalk that is ginormous, like it was grown near a nuclear power plant ginormous, and accompanied by pepperoncini, a few olives, a pearl onion, and an entire strip of crispy bacon. Like I said, a salad. I was stupid enough to order a burger and onion rings when I ordered my drink and had to take it to-go because I ended up having a Bloody Mary and it’s salad for lunch. Ok, I had two of them. Can I mention that they are served in a Pilsner glass? You know that tall beer glass that they serve the “big” beers in? Yes, that one. The best part of Bloody Mary Shots? The one thing that the Bloody Mary Shots were missing is a salt rim. I love a good salt rim with my drinks. Being known as a salt stealer, because I steal salt from other people’s cocktails when mine is gone and I still have some cocktail left in my glass, makes my point. I usually do it while they are not looking and I do it with my clean fingers, not licking it directly for those germaphobes that will now never have drinks with me. Much like my Blueberry Margaritas, salt completes the cocktail. Now people are used to using table salt. I grew up on Kosher salt because I have Jewish family members and because that is what we used in the restaurant. These days there are so many kinds of salts. Artisanal salts if you will. Mushroom salt, Himalayan Pink Salt, Fleur De Sel French Salt, and my personal favorite, Merlot Salt. Yes, that is WINE salt!! Another good one is smoked salt. Like you are standing in front of a meat smoker and that wood-fired, charred smell that you love so much is in your salt! I know the perfect use for this salt, besides on my meat. That crispy bacon that I had with my Bloody Mary and salad had a slightly smoky flavor to it that brought out the other flavors of the Bloody Mary mix, the olives, and even that huge-antic celery stalk. 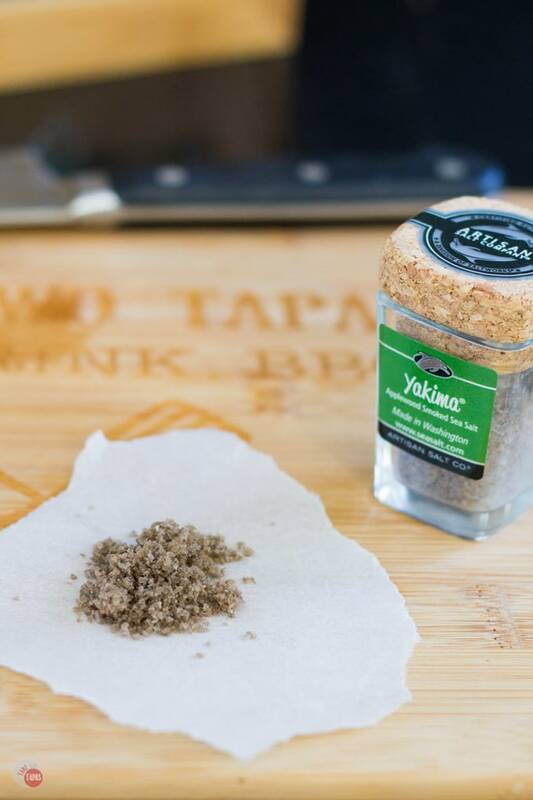 Smoked salt is the perfect way to rim my Bloody Mary. And if I am wanting a small one, since that other one is too big for all occasions, Bloody Mary Shots! 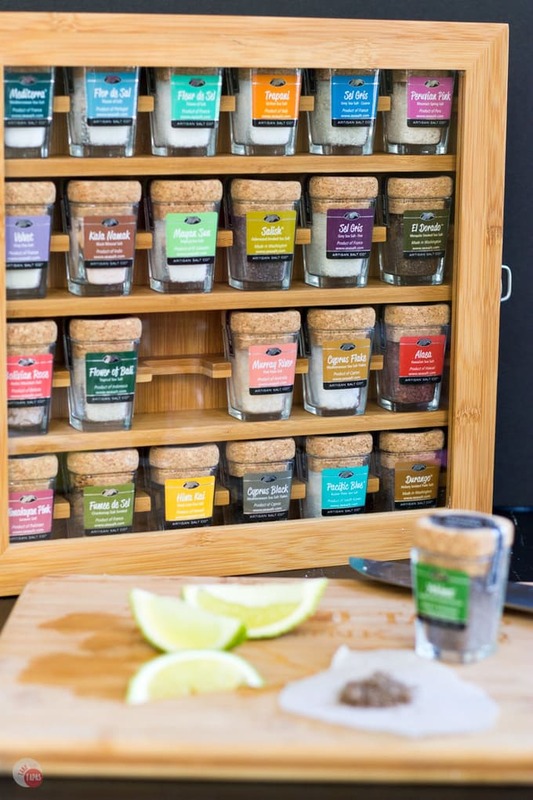 Speaking of shots, can I tell you about my collection of artisanal salts? They are packaged in, if you care to guess, shot glasses! Where did I get my salt? I have a cabinet of artisanal salts that I got from Uncommon Goods. Have you ever heard of them? They are an online gift catalog that likes to offer designer jewelry, decorations, and other household items that are made without harm to animals or the environment. Based out of Brooklyn, NY they have been awarded for their outstanding customer service every year since 2007. In 2015 they introduced the Uncommon Collection which is where I found my amazing salt cabinet. To top things off, they work throughout NYC to end hunger by being involved in food rescue, distribution, and education. Now that is a company I can get behind. Another good thing about Uncommon Goods is their Men’s Collection. I have the hardest time finding gifts for my oh-so-picky husband and their collection of unique gifts for men will help me fill his stocking this Christmas! I am planning on a series of shots on the blog in the next month, so look out for my shots that are going to be rimmed with other artisanal salts from this cabinet. Did I mention that it is made out of bamboo and it totally gorgeous? It makes a great kitchen decoration when I am not using it. Don’t you just love a multi-tasking item? Check out my Bloody Mary Shots and my other cocktails right now if you need a whole one. Tell me which one is your favorite! 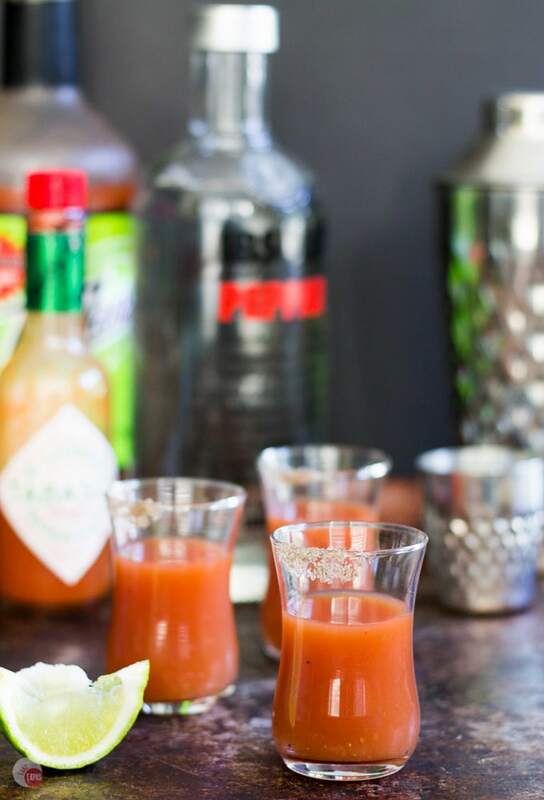 Bloody Mary shots are a great way to enjoy your favorite Brunch cocktail but in a smaller version! Rimmed with Applewood smoked salt add a great layer of flavor to the shot! Smear some fresh lime juice on a small section of the shot glass rim. Dip the small section in Applewood Smoked Salt. Combine all ingredients in a cocktail shaker or large measuring cup. If you prefer a cold shot add a few ice cubes to the shaker and stir for 1 minute to chill. Toss your cocktail shot in your mouth! Smile and make some more! A perfect compliment to our annual girl weekend brunch! Just the perfect size. The salts sound great too. You should be the poster mom for those back to school staples commercials. You remember the one’s where the parents are skipping in the isles because their kids are back to the books. Heck I will drink to that! Here is a toast to you my dear. I love all of you salt collections. I bet the smoked salt really does take this up a notch. Pinned! I love back to school! I was singing and running around like a fool! Then laid on the couch and binged Bravo for the whole day! Now I still love that they are gone but not a fan of getting up early to drag their lazy butts out of bed. These are sooooo fun! That salt sounds amazing, too! Thank you Ashlyn! They are so fun! i love bloody marys!! these shots are perfect!! I love the idea of serving Bloody Mary’s in small shot style glasses. You just knocked up the flavor with the applewood smoked salts perfectly! These are adorable and are leaving me totally craving a Bloody Mary! YUM! I love bloody marys! Making them in shot form is such a fun idea and that smoked salt sounds amazing! I love bloody Maries. So you can bet on me making these. And that Applewood salt sounds amazing. It definitely add to it. Thanks for reading! This is seriously right up my alley. Girl, we should be BFFs. Come on over for some shots anytime! I can’t wait to shop there again! I can’t wait to find some new uses for the other salts! Thanks Julianna! Keep an eye out for more shots coming this month! Salt stealer!! Well not anymore. Not with that gorgeous cabinet full of yum. No I don’t have to steal salt anymore. I just got some shot glasses made of salt too. Great for tequila! Ill be happy to send you some for your birthday!